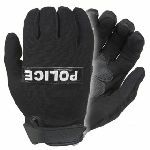 Damascus® is a legacy brand with well over 50 years of experience in glove and protective gear design for law enforcement and military. Damascus' product line focuses on head to toe non-ballistic protection. There is no company in the marketplace in Damascus' product category who has a greater collective knowledge and experience in the latest materials, design techniques, and development. Damascus is very good at what they do.